Pita bread is used to make pita wraps and sandwiches, but it is also wonderful as a bread on an appetizer tray for dips. I remember the first time I had toasted pita triangles and how simply delicious they were served with hummus. To use it for appetizers, it does need to be toasted or crisped. 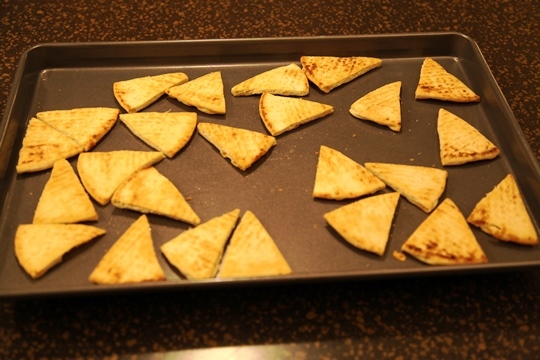 Toasted Pita Bread Triangles are one of many appetizer ideas I will be sharing over the next few weeks. 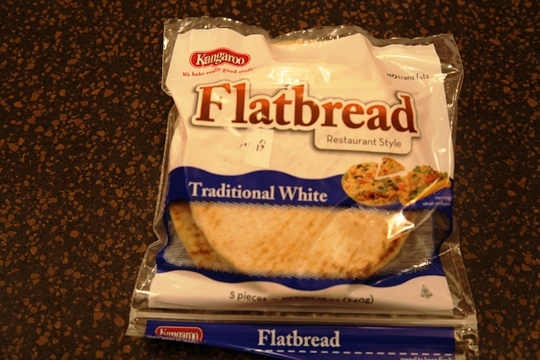 Start with a package of pita bread or flatbread. You can use either the flat bread as I have done here or the pocket pita type — it really doesn’t matter. 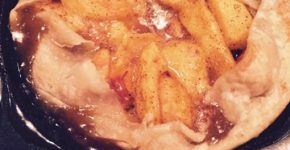 You can also use either the traditional white pita bread or whole wheat. Try it plain the first time you make it to just enjoy the simple goodness of this bread. 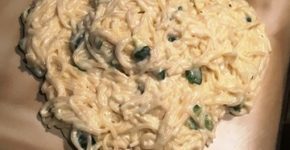 Then, add some extra pizzazz the next time you make this by adding salt or different types of dried herbs before you bake it. 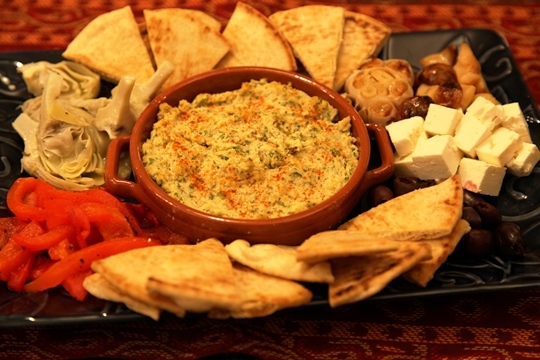 Toasted Pita Bread Triangles are wonderful served with dips...especially my Hummus Spread and Mediterranean Platter. These are quick to make and add a special touch to any appetizer. 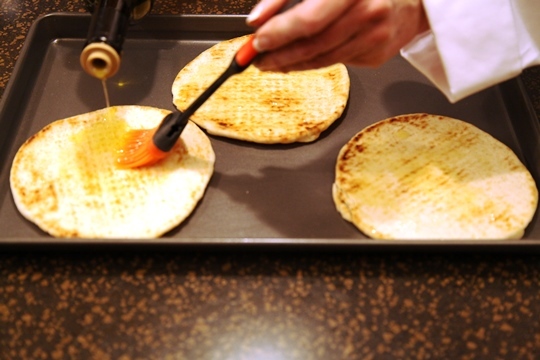 Brush both sides of the pita bread with olive oil. Cut the bread into quarters or smaller wedges. Use kitchen scissors to cut the pita. Place bread on cookie sheets and bake for 5 to 6 minutes. Turn bread over and bake for 3 to 5 minutes longer until a rich golden brown. 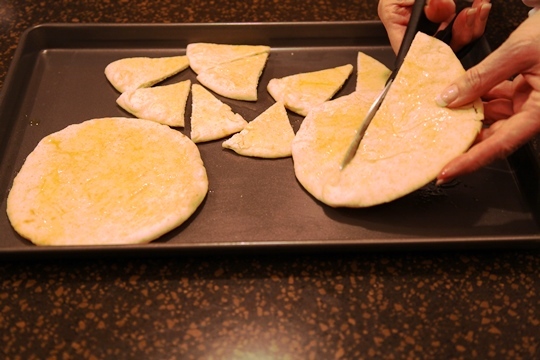 Use kitchen scissors to quickly cut the pita triangles. Bake for 5 to 6 minutes, turn over and bake an additional 3 to 5 minutes. Here you see the Toasted Pita Triangles served on my Mediterranean Hummus and Appetizer Platter – with hummus, cubes of feta cheese ( either marinated or plain), roasted garlic,artichokes, olives and roasted red pepper slices. Make ahead appetizers such as this are great for easy entertaining. All of this can be made ahead and served when your guests arrive. When I’m ready to have a house warming party at my new house I’m planning to make this and your Hummus. This is also excellent with some grated Parmesan on top. Wanted one Katie made with tomatoes ,was on same day .